Today, on the inaugural 50/50 Day, we can officially say we are a 50/50 Agency. With 98 employees across London, San Francisco and Singapore, following an equality audit, we have confirmed an even split of 49 males and 49 females in the organization. Distrupting the status quo, the percentage within senior leadership also remains at 50/50, with local leadership being paid equally. 50/50 Day is spearheaded by Emmy-nominated filmmaker Tiffany Shlain and her film explores how a more gender balanced world is better for everyone, across all aspects of society. It was this event that inspired us to review our gender balance of our agency. Gender has never been a consideration in April Six’s employment or promotion principles. We have always tried to create an environment in which women feel empowered, supported, valued and understood, which attracts talented females to join the team. Having a female CEO and two very talented women agency leaders is testament to our commitment to creating an environment where women can achieve their full potential through modeling, support and mentorship. Having achieved the 50/50 ratio, we have created an atmosphere in which women and men can equally thrive and where high potential is supported. Senior women must lead by example and consciously encourage and support other talented females. It is this level of commitment that will ensure 50/50 and pay equality are basic principles of business, and no longer barriers or limitations. However, understanding that gender balance and diversity doesn’t stop at 50/50, we will be announcing a series of commitments we’ll be making to ensure we are a truly diverse organization during our own 50/50 Day event. Like gender, any forced criteria regarding race, sexuality, disability or religion is both restrictive and limiting in relation to talent and business development. Talent should be recruited and nurtured according to capability and attitude - an ideas business is only ever the sum of its people and they are only ever a reflection of the environment they work in. 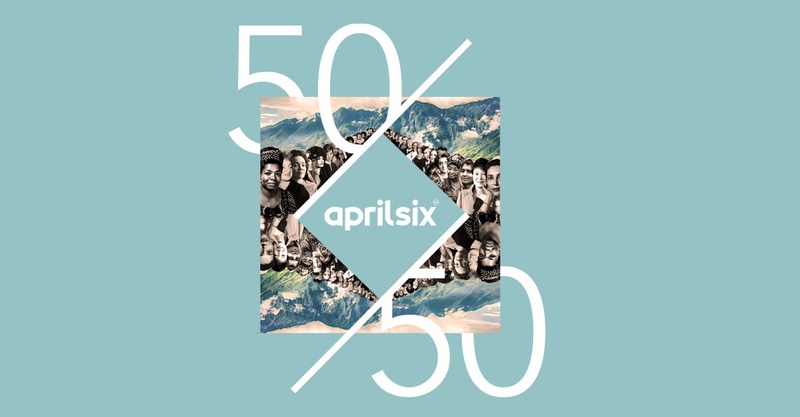 At April Six we are not only proud of our 50/50 achievement but also committed to achieving milestones across all the other diversity measures.